CHERRY LEONO, 24 years old, comes from Indonesia. As a junior majoring in tourist guide, she’s keen on traveling and photography. While, unfortunately, she was diagnosed with breast cancer. In the end of 2016, CHERRY was found a lymph node in her armpit, which is soft and movable. She searched online and mistakenly took the signs as the result of hormone excretion during puberty, so she ignored it. In Oct. 2017, she found the lymph node became hard and fixed in the lesion. In Batam, Indonesia, she was diagnosed with tumor in breast through ultrasound. In 2018, the increasingly swollen tumor became dark blue with suppurating and bleeding. Cherry was finally diagnosed with stage IV breast cancer in a cancer hospital in Kuala Lumpur. The doctor suggested her take systemic chemotherapy but she refused. “The result made me so scared and depressed. She wondered how’s the effects? Am I going to back to normal life? The doctor didn’t answer my questions. I wasn’t well prepared to accept the result, so I refused the suggestion of chemotherapy.” said her. Backed in Indonesia, CHERRY searched for other options besides surgery and chemotherapy. As a result, she found interventional therapy of St. Stamford Modern Cancer Hospital Guangzhou on Instagram. “Interventional therapy differs from systemic chemotherapy, which was recommended by doctors in Kuala Lumpur. It effectively and precisely kills cancer cells without damage to normal tissue, which brought me hope for treatment”, explained CHERRY. 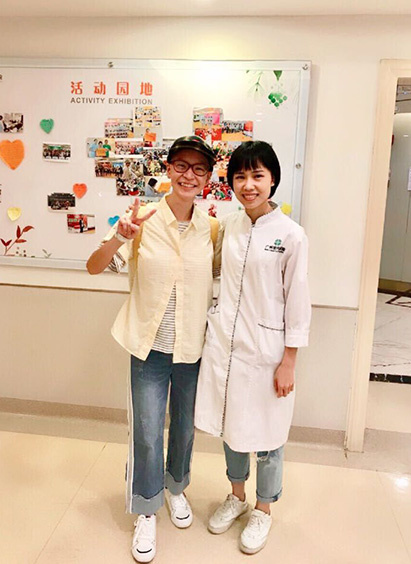 Upon the admission, CHERRY suffered a tumor measuring 6.3*8.9cm with metastases to liver and lung, the resulting abdominal distention and pain leads to difficulty in eating, coming along with symptoms of breast pain, weakness all over and drowsiness. Based on her condition, Multidisciplinary Team (MDT) came up with a combined treatment plan of interventional therapy and cryotherapy. So far, she has accepted eight sessions of interventional therapy and two cryotherapy with tumor shrinking to 2.8*5.4cm. “In the beginning of the treatment, I was terrified and cried to myself sometimes. Things get better after the interventional therapy, with four sessions of which, my condition was turning better. I could sing, dance and even play. ”said CHERRY with beautiful smile. According to her attending doctor, to avoid severe damage of surgery and systemic chemotherapy, combined treatment of interventional therapy and cryotherapy are the perfect option for young breast cancer patients as CHERRY. Interventional therapy, with 2mm trauma, anticancer drugs is directly injected into the tumor. Compared to systemic chemotherapy, interventional therapy causes fewer side effects and achieves better efficacy; Cryotherapy achieves the effect of surgery and remove tumor, reserving the breasts and effectively treat cancer. Upon the discharge, CHERRY expressed gratitude to her attending doctor, it always makes me feel at home here. I won’t forget that she visited me every one hour when I was in ICU. She often prepared presents to make me happy. Her patience and tenderness helped me get through this trail. Thank you for everything. ”speaking of her breast cancer journey, Cherry couldn’t help crying. She’s always positive and cheerful that she encourages other cancer patients. She performed dance in event organized in the hospital, she shared her anticancer story and encouraged numerous cancer patients with her confidence and optimism. “Don’t be afraid and be positive, as long as you follow doctor’s instruction and you’ll finally defeat it.” CHERRY shared her secret fighting cancer. We all cherish best wishes for her quick recovery and great triumph against cancer. Let’s fight cancer together. Stage IV breast cancer, cancer, minimally invasive therapy, St. Stamford Modern Cancer Hospital Guangzhou, interventional therapy, cryotherapy.